We recently started offering FREE BRUNCH for all of our guests. We serve rice with tradditional Japanese BRF. plum, pickles, ginger and miso soup. Also it is possible to additional Japanese foods such as Kyoto taste eggs, TOFU, natou (fermented soy beans) (40JPY), Ramen, Bread 2 pcs. (50JPY). JGH is now on 'maps.me' and 'Google Maps'. 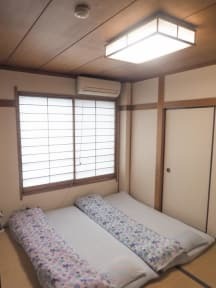 We are conveniently located near the Kawaguchi JR-station just a 10 minutes walk through the very nice, very authentic neighborhood. We have a supermarket (regularly open between 10am to 9pm) just 5 minutes by foot from the hostel and both 7/11 and Family Mart within the same distance. Also, even closer, there is a traditional Japanese bath house, 'Kirayuku' which is accessible for only 430 Yen (cheaper than most bath houses). Kawaguchi JR-station is connected to the Keihin Tohoku (Major BLUE line) so you do not have to transfer in order to get to Tokyo station, Akihabara, Ueno, Shimbashi (to go to Odaiba), Shingawa (to go to Haneda airport) and etc. It takes 15 minutes to reach central Tokyo by train (Ikebukuro, Nippori) for the cost of 165JPY ($1.50). Ueno and Shinjuku 20 minutes ($2.00). We always welcome long term guests for a discounted price. Please let us know how long you would like to stay and we will find you a suitable price. This option is approximately 60 minutes. Total 800JPY. This should take about 70 minutes. Total 800JPY. then take Keihin Tohoku Line to Kawaguchi. We made a map for you to print and bring if that feels more comfortable. İt was wonderfull to stay there . They were so friendly and lots of nice people there. great place to stay for the cost. Yeah its little far from Tokyo and about a 15 minute walk from the nearest station, but you really do get an authentic feel. Meiko-san is a fantastic person who really makes you feel welcomed. Well, This is not a Hotel or Hostel. It's someone's HOME, in my opinion. So if you want some modern facilities or services, you might get a little disappointment. But If you want know what it looks like a Japanese lifestyle, it should be a good place. 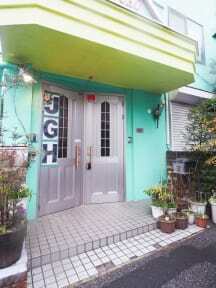 It’s a small Japanese hostel, in general is good. But men’s room was so overcrowded and cleanliness was not as good as I wanted. Only one toilet and it smells terrible. Pee stains on the floor. Got bitten by dozens of insects during the night, including what I think was a giant centipede which was painful for a couple weeks. Staff was very friendly but the owner's assistant was sleeping in the same room as the guests and was up and down all night turning lights on and off in the room. Bed was not clean - crumbs all over the mattress. No comfortable places to chill in the hostel. Wish I'd stayed at the media cafe. Didn't feel the security was good since the front door is always open, no safes, and no privacy. Rooms were a bunch of bunk beds stacked next to each other. Not very clean and the location wasn't too good. Also the place smelled of cigarette smoke which really turned me off. However it is cheap, so not the worst place to stay if you don't mind that sort of thing. Staff were very nice however. Kitchen and shower were filthy, bathroom was okay. You wash up in the kitchen sink. The laundry machine can’t be used and living on the main floor means you hear everything outside the thin shutter door. Beds are thin and uncomfortable/dirty. Found wrappers and dirt under the bed. No safety box, no lamps, no curtains, no space, and hopefully you don’t get the top bunk or a dirty heater will be blowing air into your face all night. Location is creepy and very far from the station. Cheap, though!